My current cartridges are no longer recognised for the Epson SX438W printer. Will your cartridges work? Yes, our premiumn brand compatible Epson Stylus SX438W ink cartridges work in exactly the same way as genuine Epson cartridges and are fully compatible with the printer. They are fitted with their own chip so you can easily install our compatible Epson SX438W cartridges without any hassles. If you do ever have any problems with your Epson SX438W printer recognising our compatible cartridges our customer care team can offer you troubleshooting suupport and we'll give you a full refund if you aren't entirely satisfied after purchasing these ink cartridges. My printer stopped recognising the cartridge T1283 although only the black T1281 cartridge is half empty. I've had no problems until now, what could I do? Also, where could I buy a new pack of four cartridges for an Epson Stylus SX438W printer? Thanks. 1. Turn off the machine at the plug socket. 2. Remove the cartridge and wipe the chip on the cartridge if it has one. 3. Leave for 15 minutes then turn the printer on and re-install the cartridge. If you still get the same error after this procedure please contact the supplier of your cartridges. My printer is an Epson Stylus 438W and I'm a home user only. The printer has a paper jam and I'm wondering what the cost to repair it will be? The printer is approximatey three years old. Cartridge Save is an online printer supplies retailer so we only supply the Epson Stylus SX438W ink cartridges and consumbales rather than handling repairs for the printer. We advise you to contact Epson's technical support team in order for them to diagnose the printer error for you and run you through some troubleshooting steps. If your printer does require repairs Epson should be able to advise you of the estimated cost and how to go about finding a printer engineer to come and service the machine. I have Epson SX438W cartridges in now for T1281 - T1284. Do your T1295 ones fit and work? Yes, any cartridge listed on this page works in the Epson Stylus SX438W printer. The T1295 is a 4 colour pack of high capacity cartridges (T1291 - T1294) that you can use instead of the T1281 - T1284 cartridges you're currently using. There are two sets of ink for the Epson SX438W printer indicated by the different packaging with Fox ink cartridges being the standard capacity inks and Apple ink cartridges being the high capacity inks. You can use either of these ranges in the printer and mix and match them within the printer as long as you have one cartridge installed in each of the four separate colour slots for black, cyan, magenta and yellow. I recently purchased a set of cartridges which were sold as fitting my Epson SX438W printer (from a local store), but the printer will not recognise them. When I look at them the printed circuit on the top is different. They all had the correct cartridge numbers on, the same as the ones on your website. How can I be sure that these will fit, unless I buy the Epson cartridges? Will compatible SX438W inks work in my printer? Do you supply compatible ink for the Epson SX430W printer please? The Epson Stylus SX438W may be small, but this impressive unit is a multifunction printer that is also capable of copying and scanning. 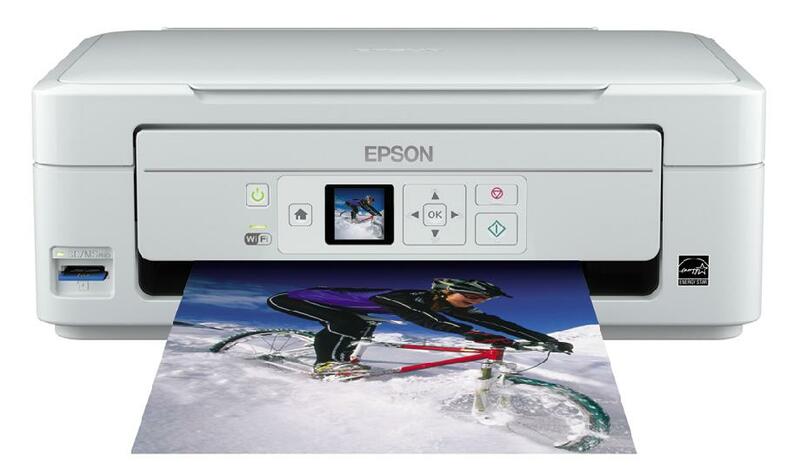 The Epson SX438W small-in-one is great for home use as it delivers text documents, graphics, and photos. It can deliver a resolution of 5,760 x 1,440 dpi; scan resolution is 1,200 x 1,200 dpi. This compact unit comes with an LCD display. Since the Epson Stylus SX-438W multifunction printer is small, it lacks several features like a PictBridge port. Measuring 390 x 300 x 145 mm and weighing 4.1 kg, the Epson Stylus SX438W flexible small-in-one printer is one of the lightest and smallest multifunction units in the market. This modern and stylish printer has a flatbed scanner and a printer at the bottom. The Stylus SX438W printer can handle 100 sheets at a time. The small control panel features a colour LCD display. The Epson Stylus SX438W inkjet printer is equipped with Wi-Fi and it also has a memory card reader and a USB slot. This handy unit has a small footprint making it ideal for small offices or homes. It delivers great looking output and it has handy features. The Epson Stylus SX438W all-in-one can work PC-free and offer photo enhance and red-eye removal. Print speed for black and white, 33 ppm, is impressive, and reasonable for coloured, 15 ppm. The Epson Stylus SX438W wireless printer is compatible with Macintosh and Windows computers and it can print wirelessly through tablets and mobiles. Options are plentiful when it comes to replacing the Epson Stylus SX438W ink cartridges. With high capacity inks and cheap compatibles that will also work in the machine, saving money on the Epson SX438Ws consumables can be really easy. The Epson Stylus SX438W wireless all-in-one colour inkjet printer does not offer a PictBridge port and automatic duplexer, even as options.